At our annual benefit dinner Wednesday night, the Authors Guild presented the 2016 Award for Distinguished Service to the Literary Community to Suzanne Collins, author of The Hunger Games trilogy and The Underland Chronicles series. Collins was honored for exemplifying the unique power of young people’s literature to change lives and to create lifelong book lovers. It was the first time the Guild presented its annual award to a YA author. Fittingly, the evening’s ceremonies, presided over by author and former AG president Roy Blount, Jr., paid tribute to young adult literature. The entertainment began with a whirlwind performance called “The Hunger Games in 10 Minutes,” performed by Stephen Durosaiye and Tavan Thomas, high school students and the charter school Bronx Prep, and 2015 National Speech & Debate Champions. Collins was followed by three distinguished authors of books for young readers—Norton Juster, Rick Riordan, and Andrea Davis Pinkney—speaking on why they write for the young. Pinkney, author of over 20 books and winner of a Coretta Scott King Award, offered a paean to the power of books to reach those who may need them most: the young, the marginalized, those who feel invisible among us. 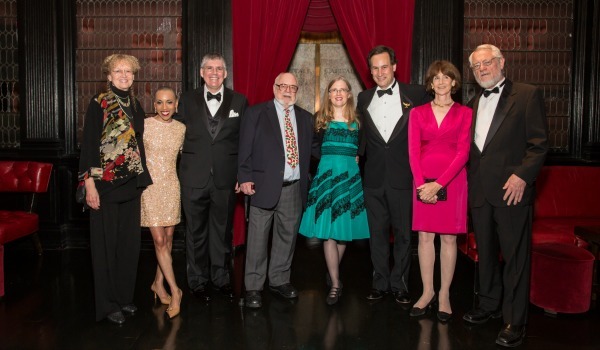 The Authors Guild Dinner, held annually since 1993, benefits the Authors Guild Foundation, which conducts advocacy and education to support and protect the profession of writing and welfare of writers everywhere, and the Authors League Fund, which has provided vital financial support to book authors and dramatists in need for almost 100 years. Sidney Offit served as president of the Foundation for more than 20 years. At the Dinner the Guild honored him for his service and presented him with a custom-bound volume of reminiscences from his friends and colleagues. The Guild also paid tribute to former Executive Director, Paul Aiken, who passed away in January after a courageous battle with ALS. Many thanks to all who offered their support.